Intek Truck and Equipment Leasing has an experienced and knowledgeable staff with years of experience leasing all types of Balers, Compactors, Conveyors, Electronic Destruction Equipment, Grinders, Separators, Paper shredders, Mobile Paper Shredders (Shredding Trucks) . We understand the shredding and destruction industry. Specializing in Truck leasing for the Document Destruction Industry Intek Leasing has the understanding and expertise necessary to help your business grow. With customized lease terms to match your individual needs Intek can help you acquire the equipment you need. Please feel free to call us with any questions you might have about the Mobile Document Destruction Industry; we have worked with companies big and small and we can put you in touch with our network of clients and learn valuable lessons from seasoned veterans. Intek Truck and Equipment Leasing is proud to offer a 7 year lease financing program on New mobile shredding trucks. Please call our representative Paul with any questions you might have about the Mobile Document Destruction Industry; he has worked with companies big and small located all over the United States. Customized for business owners who want to own their mobile shredding truck at the end of the lease. Our lease-to-own program provides more flexibility than traditional bank financing. After all the lease payments are made, you'll own the truck. We understand that an older mobile shredding truck can make more sense for your business. If the vehicle is the right fit for your business, we'll finance it for you. Unlike banks, we don't impose rigid age restrictions. 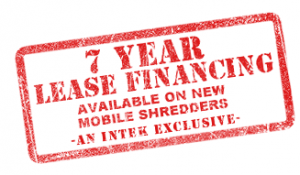 Interested in financing your next mobile shredding truck but haven't found the exact vehicle you need? Then our Preapproval program is a perfect fit. We’ll quickly give you an approved amount, along with your expected down payment -- minus the annoying red tape.